What better way to learn colors than from food! Blue carrots? Purple eggs? 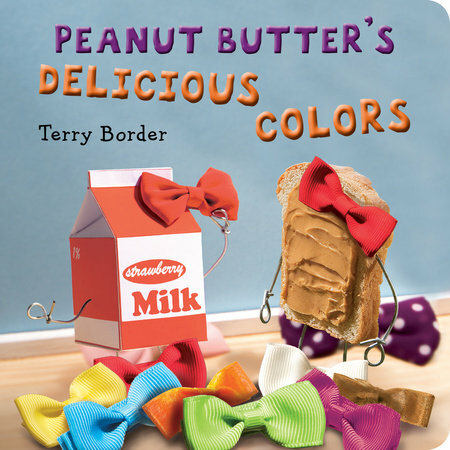 Kids will laugh out loud at this new offering from the creator of Peanut Butter & Cupcake. Milk wants to give bows to all of her friends, and she wants them to match! She gives Carrot a blue bow, but that's not right—Carrot is orange! She gives Lime a yellow bow, but that's not right either—Lime is green! And when it comes to sprinkle-covered Cupcake, what is Milk supposed to do? She knows—Cupcake gets a Rainbow bow! In this latest addition to Terry Border's fun, funny, and punny concept board books, colors get their time to shine.